Do you have a soundtrack for the major events in your life? I am one of those people who constantly have music running through my head, about 95% of the time. Sometimes it is an earworm that can’t be shaken, or a piano or chamber music piece that I’m working on, or just something I heard recently. 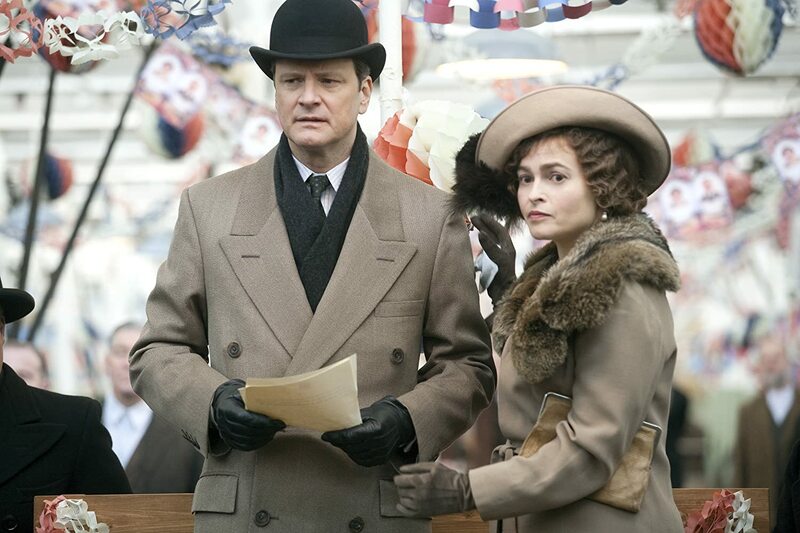 I recently watched The King's Speech again and I was struck by how fitting the music choice of Beethoven Symphony No. 7, 2nd movement was for the final speech. The somber tone of the piece, moving at a slower tempo, set the stage perfectly for the grave nature of the king’s call to war. I prefer this movement at a slower tempo and feel that it is far more fitting played in Moderato or Andante than Allegretto. This piece perfectly highlighted the angst of King George’s struggle with his speech impediment as well as his regret for having to call his countrymen into war. In the scene, the people of England were all leaning into their radios, hanging on every word of the speech, united by their king, united by the words, united by the pauses, united by the music. It is a masterful piece of film. After the speech, the credits were accompanied by the incredibly poignant Adagio movement of Beethoven’s Emperor Concerto (Concerto No. 5 , the last time I remember it featured in a film was in The Competition ). Since then, both those pieces have been playing on my iPod and in my head constantly. Last month, my cat Ebony had to be put down. She had a long wonderful life. But in the last months when she fell ill, we were very sad. During this time, the two Beethoven pieces with their sorrowful melodies kept running through my head. It was the perfect accompaniment to this sad chapter of our lives. Here is a celebration of Ebony's life. Doug and I picked up Ebony while we were still dating nearly 17 years ago. I wanted to have a cat that was female so that she could have kittens. 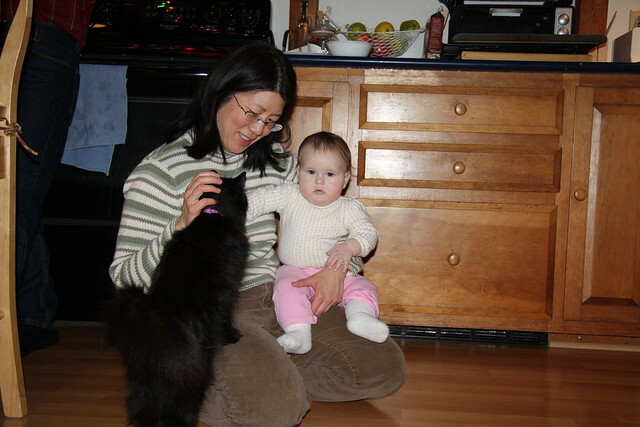 I also wanted a black cat so that her cat fur wouldn't show up on my clothes. When we saw Ebony, a scrawny runt among a litter of free kittens for adoption, she immediately picked us. She velcro'd herself to my shirt and wouldn't let go. Since she fit my requirements, we took her home despite her diminutive size. I love this photo of Ebony and Doug as she is so tiny and cute and they both have the same expression. When she was a kitten she always had those crazy eyes, constantly running everywhere and needing lots of attention. Sure enough in about a year she became pregnant and had a litter of just two kittens. In most of the photos, the three of them are just a sea of black fur but this one shows all of them, Ebony, Wysiwyg and Fezziwig (yet another long story about their names). 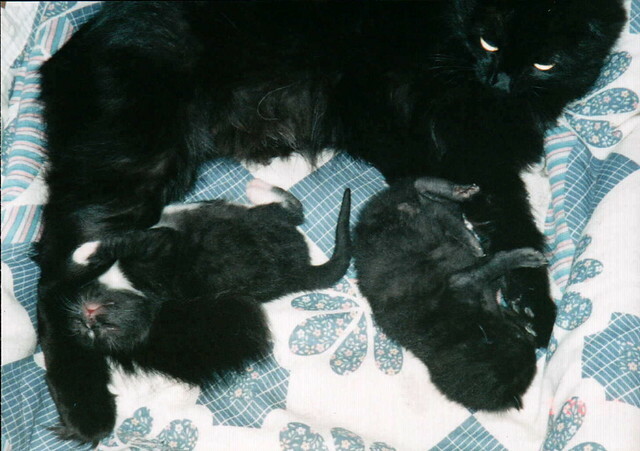 She was so proud of these kittens when they were born, but after they were about 12 weeks old she grew tired of them. 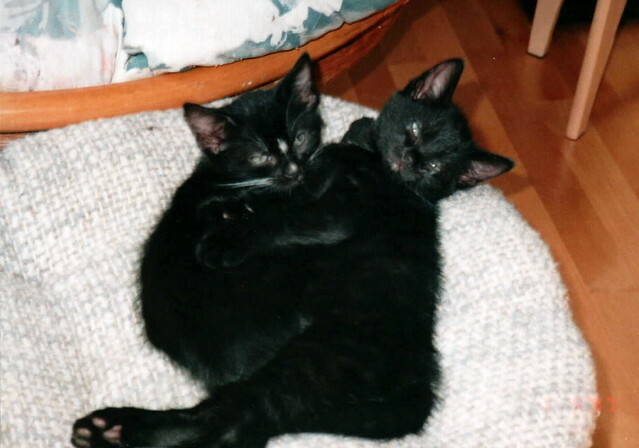 We couldn't separate the two kittens so we ended up keeping both of them as they were inseparable. A couple years later, I got a call from a woman who said that she found Ebony on a busy road near our house. She had been run over by a truck and was in the middle of the road not moving, but the woman still stopped to pick her up and wrapped her in a blanket. The woman called the phone number on her ID tag and we quickly met up. I couldn't believe that this woman with young children in the back of her car stopped to pick up a seemingly dead cat from the middle of a busy road! I don't think I would have. After we thanked her profusely, Doug and I drove Ebony to the vet, not expecting good news. Ebony was still wrapped in the woman's blanket. After an exam, x-rays and an overnight stay, she came back to us with no more than a scrape on her chin and some broken teeth. It was a miracle. One of her nine lives was used up for certain! I still think about this woman's selfless act. If Ebony had not been picked up, she would have surely been run over again on this busy street. A few months after this incident, Fezziwig came to an untimely end in a meeting with coyotes. Around the same time, I became pregnant with Adam. We always felt that Adam was a reincarnation of Fezziwig. When I was seven months pregnant I was carpooling to work with my friend when an accident occurred in front of us. An long-haired tabby cat darted out in front of the truck ahead of us and was run over right under the wheels. I immediately pulled over next to the cat who was flailing on the ground and scooped him up in my arms, paying no attention to the cars driving around us. It must have been quite a scene - pregnant woman jumps out of car on a busy street to pick up flailing cat who was just run over. I'm not sure what possessed me to jump out of my car, whether it was flashback to Ebony's rescue, or my new motherly instinct kicking in. The cat was thrashing violently and I had to hold him tight against my pregnant belly to calm him down. The driver of the truck had also pulled over and told us that he knew where the vet was located a few miles down the road. My friend drove while I held on to this cat. Before we arrived at the vet, the cat finally calmed down in my arms. By the time we arrived, he was pronounced dead. He was still warm, so I had no idea that he simply died peacefully in my arms. So peacefully that I had not noticed that he pee'd all over my shirt. This was going to be a bit of an odor problem for work, so we went to a mall to buy some new maternity clothes and walked for an hour before the stores opened. If I stood in one spot, the smell would overwhelm us, so we had to keep moving and not look at anyone's faces in our wake. I showered at work and donned the new clothes, but the smell still stayed with me all day. I was really struck about the similar scenario regarding Ebony's encounter with a truck, but with completely different outcomes. Ebony prospered for many years. One of her favorite pastimes was hopping right into a middle of board game, card game or jigsaw puzzle. 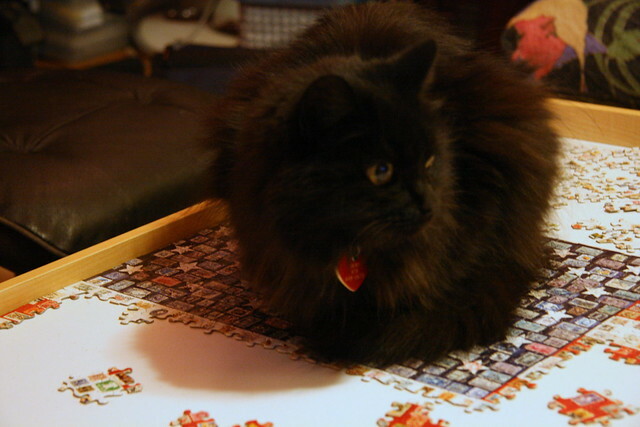 Here she is offing Professor Plum in Clue Jr.
And recently staking out space on a jigsaw puzzle. And before he could read. When it was clear that Ebony was nearing the end of her life, the tough decision had to be made to put her down. A couple months ago, her belly swelled up in a matter of weeks. We took her to the vet and she had surgery to drain a milky white substance called chyle. There was no clear reason why this was occurring, common causes are cancer or other lesions. After an overnight stay and $600+ she was back to normal. But within a few weeks she had swollen up again. She was clearly ill, but still functioned fine for the most part. We could continue to plunk down huge sums of cash to drain her every few weeks, or have her go through a painful death when the chyle choked the functions of her lungs and heart, or simply put her down. Doug couldn't face the reality of taking her to be put down, so I made the appointment. Adam didn't want to hear or know anything about it, but Dova was keenly interested in going with me. I warned her that this would be extremely tough, but she's always been the type of person to take on problems and situations head on with all her focus and intensity. She also insisted that we bury Ebony in the yard as opposed to sending her off in a group cremation or taking her ashes back (the girl never makes things easy for us!). Here's how it went (warning, not for the weak of heart, and maybe even not you, Doug). I brought Ebony in her carrier, with a towel, the blanket she was rescued in over 12 years ago, and a cardboard box. I imagined that I would hold Ebony while she was being put down and would have the towel over me to protect from the relaxing of the bladder muscles I was so familiar with. When we arrived, I explained to the vet that Dova wanted to be part of the euthanasia process. The vet looked at me and said, "Wow, you're doing some advanced parenting here." I explained that it was Dova's idea. He explained that it was unremarkable process, where she would first be sedated, and then injected with the chemicals to stop her heart. Unremarkable as he claimed, the vet kept asking whether Dova would prefer to go feed the horses outside instead of watching. She started to doubt herself, so I stepped in saying that we've come so far, let's do it together (advanced parenting, right?). Bear in mind, that I have never been through this process myself, so I wasn't prepared for this either. The vet put a towel down on the examination table and Ebony laid quietly on it. I didn't want to insist on holding her, so I just let the process unfold. After she was injected with the sedation solution, I petted her and rubbed her face like she enjoys, telling her that she was a good kitty and had a wonderful life. She just laid there, relaxed, moving around just a little. At some point, she stuck her tongue a couple times out to lick her face. Finally she was still, with her eyes open. The vet said she was sedated and gave her the final injection to her heart. We waited a few minutes and the vet used a stethoscope to check that her heart stopped beating. Her eyes were still open. I tried to shut her eyes but they remained open. The vet explained that the relaxed state of eyes was open. I was surprised, you mean when you're sleeping, you actively have to keep your eyes shut? Yes, apparently it was part of the autonomic system. The vet explained that when people died, they had to superglue their eyelids shut for the funeral. Wow, there's an interesting science lesson to distract us from what was happening. Afterward, I explained that we wanted Ebony to be wrapped in the blanket that she was rescued in years ago. The vet started to wrap Ebony up and she was completely floppy, with no muscle control at all and clearly lifeless. As he turned and spun her in the blanket, I must have had a shocked look on my face. The vet turned to me and asked whether he was doing it right. Then he asked if I was alright, I looked like I was about to cry. Of course this is the absolute worse thing to say to someone who is holding back tears. I quickly wiped my face and tried my hardest to maintain my composure. Dova looked to be in about the same boat as me. After the blanket, the vet wrapped Ebony in a cadaver bag and taped it shut. We closed her in the Amazon cardboard box and took her out of the room. The box was warm. The vet graciously said that he would bill us so we didn't have to pay now. As we walked out of the office, I suggested seeing the horses, but clearly neither of us was up for it. After I put the warm box into the car and sat in the driver's seat, I looked back at Dova and told her that she was a very brave girl. That opened the gates for the waterworks. I hopped into the backseat and held her as we both cried uncontrollably. After a good ten minutes, we headed home. Since we didn't have the hole in the ground ready, I put the box with Ebony into the freezer in the basement. The box was still warm. Our appointment with the vet was carefully scheduled between work and Dova's gymnastics practice. When Dova was in her room getting dressed for gymnastics, I went in to check on her. She was crying next to her bed. I held her again and told her that we needed to continue on with our lives. That it was OK to feel sad, but it will get better. She was able to regain her composure and made it to gymnastics practice, just a little puffy-eyed. Everyone once in a while, we make the mistake of calling Ebony's name but we have adjusted to her loss. We were originally not going to get another cat, but a month after we put her down, we visited a local cat shelter and picked up a short-haired orange male tabby, completely opposite from Ebony. He has filled our lives with a totally new personality, but Ebony will always be with us in our hearts. Especially when I hear Beethoven's 7th Symphony. Very touching post, and it really encapsulates the loss and how our pets become an integral part of our family. You wrote a long touching story about your Ebony. While I was reading your story, I wept too. I am glad that I inspired you to love and appreciate cat(s) in your life. 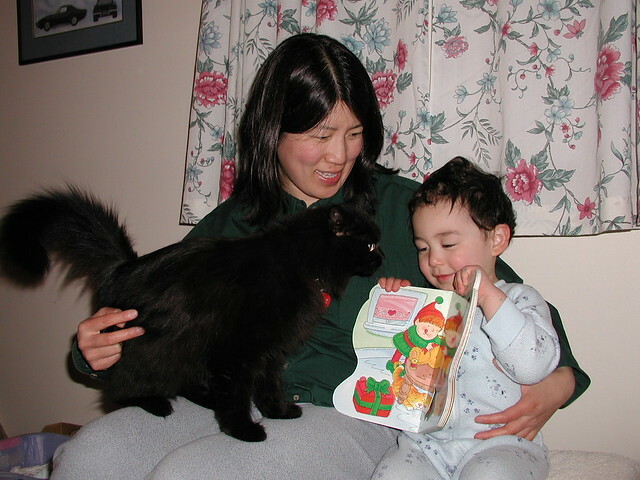 Cat is my soul mate when I was a little girl at Dova;s age in the remote Chinese village and I always wanted to have the companion of a cat despite all the unfavorable comments asking me not to raise a cat in the house. I had alleys. Himalayans, Persians and others. At this right moment, my Hua hua, a 8 year old calico strolled over my laptop, demanding some affection. Wonderful! Poor kitty. What a nice life she led though. 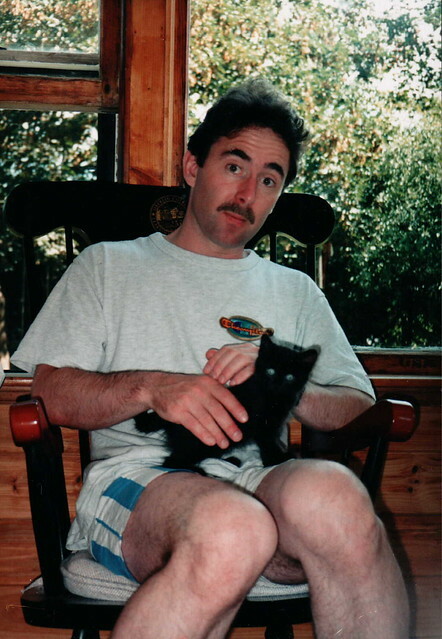 And I loved the bit about needing a lack cat because of the black clothes. 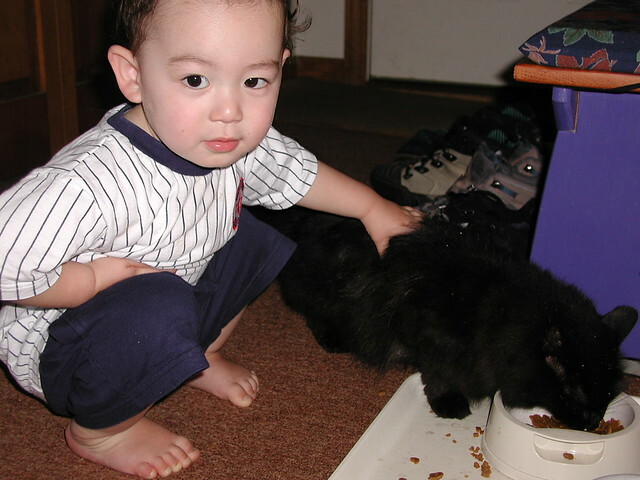 We had Siamese which were the worst for shedding - it looked white on black, and black on white.